Anti-lift/Caster Kit - is designed to add +0.5 deg static caster to both front wheels while changing the nature of front anti-dive and lift geometry. The low compliance bush also maintains higher dynamic positive caster. Please read complete fitting instructions and check kit components prior to fitment. These instructions are to be used in conjunction with workshop manual, and it is recommended that all work be carried out by a qualified technician. 1. Measure wheel alignment settings prior to any disassembly (optional). 2. Disconnect front swaybar endlink and ride height sensor (if equipped) from control arm. 3. Raise the vehicle with a hoist / lift or alternatively raise and support on safety chassis stands, and remove front wheels. 4. Disconnect ball-joints and remove control arms. 5. Press out original rear bushes from control arms and clean any debris from the eyelet. 6. Press new bushes into control arm, and apply grease to the inside of the bushes. NOTE: When removing the bush from aluminium style arm (STI), the correct size press tool must be used. If any material is removed from the arm eyelet during bush removal the interference fit of the replacement OE or aftermarket bush will be reduced and this may cause premature movement or failure. Suggested press tool outer diametre 59.5mm. NOTE: Liberty/Legacy models require the use of the supplied steel washer to be inserted under the bottom of the lower urethane thrust washer to improve the working surface of the bush. In all other applications this washer is not required and may be discarded. 7. Complete the assemblies using new eccentric crush tubes with the adjusting wheel positioned above the centre bush and the thrust washers positioned on top and bottom of the centre bush, as shown in Fig 3. 8. Refit control arms and re-connect ball-joints. 9. Tighten all hardware to manufacturers’ torque specifications. 10. Refit wheels and lower the vehicle. 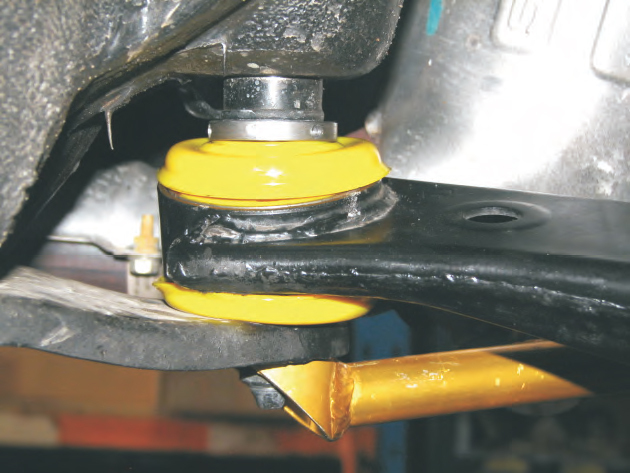 Note: If rubber bushes are used in the front position, loosen control arm front inner mounting bolt to release any pre-load in the bush and re-tension to manufacturers’ torque specifications. 11. Re-connect swaybar endlinks and ride height sensor (if equipped) and tension to manufacturers' torque settings. 12. Test drive the vehicle and check tension on all fasteners. 13. Check and adjust wheel alignment to desired settings.To adjust caster, loosen lower control rear mount nut (below retaining plate) and using a suitable pin/tool turn the eccentric tube in the desired direction. 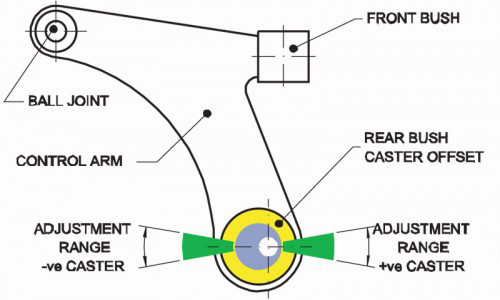 To prevent front bush failure, ensure crush tube hole is within the adjustment range as shown in Fig 2. 14. Check and re-tension all fittings again after 100kms but no more than 200kms.